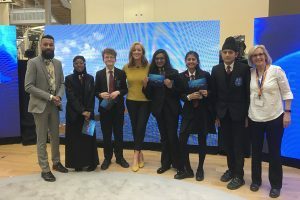 Deep Ocean Live: Sky News makes history with first deep sea TV bulletin – Joined by Featherstone High Students in the Studio. 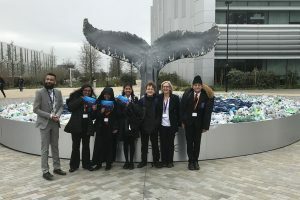 Five lucky Year 7s traveled to Sky News HQ on the 20th March to appear on a Q&A session to the presenters from the Ocean Deep Live Broadcast who were at the bottom of the Indian Ocean! The series of broadcasts leading up to this have offered a rare glimpse at Aldabra, one of the Earth’s most heavily protected coral atolls, 600 miles southwest of the Seychelles. 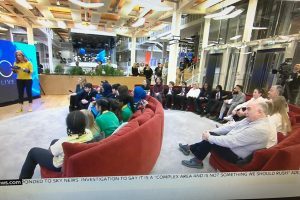 Our students (Joel, Nabila, Shubhkarman, Kiranjot and Krupa) participated in 1.5 hours of live TV on Sky’s News Channel alongside three other schools from around the country. The students posed their thoughtful questions about the ocean to presenter Anna Botting and Nekton mission pilot Randy Holt who were 300m below sea level, exploring the twilight zone of the ocean in the submarine. Click here to see more photos and video clips from the broadcast. As a school we want to thank Sky for this amazing one-off experience. To find out more about the Deep Ocean Live Project, please click here. Since the visit to FHS from the CEO of Sky, Jeremy Darroch and Jamie Redknapp (ex-footballer and now pundit for Sky Sports) (who both spoke passionately about the terrible effects of plastics on our environment) FHS has been working towards going single-use plastic free.